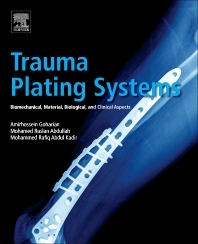 Trauma Plating Systems is the first reference and systematic book in the topic of trauma plating system in view of biomechanical, material, biological, and clinical aspects. The effects of these aspects on effectiveness of trauma plating fixation are deeply reviewed, discussed, and challenged from which promising evaluation and development concepts are explored. This book is divided into five sections: Section I covers general concepts of biomechanical, material, biological, and clinical aspects. Then it provides fundamentals of trauma plating systems, principles of biomechanical evaluation methods, and biomechanics of plating fixation in Section II. Section III reviews current metallic materials with their advantages and disadvantages in plating fixation of bone fractures and new promising materials with their potential benefits to enhance the effectiveness of plating fixation. Section IV represents currently concerned biomechanical-clinical challenges of plating fixation for various bone fractures, and Section V presents current and new development concepts of this type of trauma implants. This book as an accessible and easy usable textbook for various disciplines of audiences who are dealing with trauma plating system and fixation such as orthopedic surgeons, trauma implant manufacturers, biomechanical researchers, biomaterial researchers, and all biomedical or medical students and residents in different levels of education. Author has been diligent in both engineering and research environments in terms of research, testing, analysis, validation, verification, clinical studies, and technical writing. His main interest and effort is to integrate biomechanical, material, biological, and clinical requirements of orthopedic implants for creation of novel design conception in this industry. He has developed the website http://orthoimplant-development.com/ for further communication in development of orthopedic implants. Mr. Amirhossein Goharian is an independent product developer in the field of orthopedic implants. He holds a master’s degree in both biomechanical and biomaterial engineering. With background in mechanics, biomaterials, and biomechanics, he has been engaged in research and development in the areas of trauma implants and total joint replacements since 2011. His main concern and interest in the development of orthopedic implants is the effective incorporation of biomechanical, material, biological, and clinical facets simultaneously to optimize the implant design, technology, and features and ultimately to enhance the biomechanical and clinical benefits of orthopedic implants in treatment of bone injuries, particularly in patients with osteoporotic bones. He attempts to challenge current concepts and methods of evaluation and development of orthopedic implants and to create and propose novel concepts for future development of these products. In the area of trauma plating systems, he has acquired rigorous and significant information regarding (1) design engineering, (2) biomechanical testing and analysis, (3) clinical studies and investigations, and (4) bone biology, bone biomechanics, and muscle-tendons constraints on effectiveness of trauma plating fixation in treatment of bone fractures. His experience and studies with regard to trauma plating systems motivated the writing of this reference book on this topic. As was presented in this publication, he aims to explore new development concepts and novel conceptual implants in future publications with the hope of advancing the biomechanical and clinical benefits of orthopedic implants. Qualifications & Experience: Various aspects of biomedical engineering such as biomaterials, biomechanics, image processing, tissue engineering, bioactive coating, FE and experimental evaluation of orthopaedic implants and soft tissues, in vitro and in-vivo clinical studies, orthopaedic implant clinical investigating, etc. Qualifications & Experience: Experimental testing of composite biomaterials, Processing of composite biomaterials, Mechanical Evaluation of Orthopedic Implants. I like this book.This book is very helpful for our undergraduates.